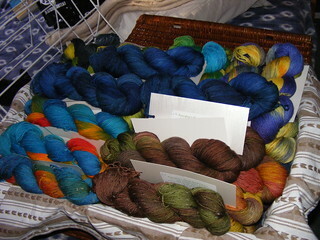 Fibre East is this weekend, and the last lot of yarn is all done - packaged, labelled, and boxed. 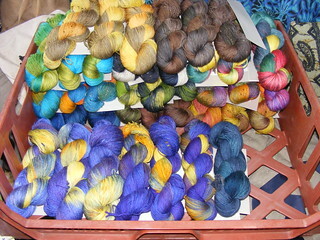 40 skeins of sock yarn (BFL/nylon, Falkland/bamboo, BFL/Donegal nep), all freshly dyed up. The one advantage of this hideously warm weather is rapid drying, even if the kitchen turns into a level of hell with the hot water, hot oven, hot wet wool. This is it all packed into a large wickerwork hamper which Mark found for me the other week in one of Bingley's antique shops. 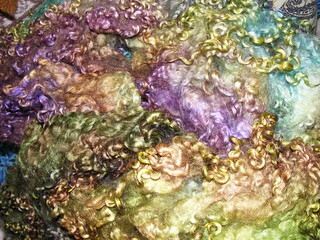 It's huge, and I can get all my yarn in it - there's at least as much again as the stuff I've just dyed. 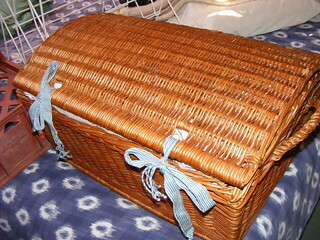 And here's my lovely hamper, neatly packed up and tied down. Yes, that is a couple of lengths of inkle-braid tying it down. And the hamper will be excellent for display on my stall too. So there we are, all ready for Fibre East. Yarn and fibre done, camping stuff ready to assemble and stuff in the van on Thursday, orders separately done. 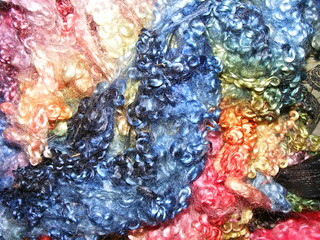 I bought a Leicester longwool fleece at Woolfest, as nearly all the bags of dyed Gotland locks had gone from my big sack of various dyed fleeces. It was huge and grubby, but rather to my disappointment not nearly as well skirted as I'd have expected, given that it was expensive and bought by weight. However, I refused to throw away the stuff I'd have skirted off if it had been a cheaper fleece. I stuffed it in the larger bucket (and it was full, that was how much fleece there was), covered it with cold water, and left it to soak for four days. It's warm at the moment - I'm sure you can imagine what fermented sheep poop and filthy fleece smelt like when I poured it out. In the kitchen. It then spent three days drying outside - there was no drying space inside, with bfl/silk tops on the drying rack, and two baskets of alpaca fleece on the creel in the living room. Being dampened with a bit of rain, and a few days of hot sun and breezes made sure there's not a trace of sheepy whiffiness left on it. So, lots more locky fleece to bag up. 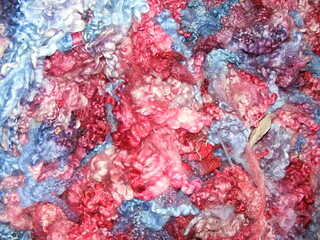 Of course, I've only just remembered to order more bags on eBay, I ran out of them packing stuff up just before Woolfest.